Skyline Advisors (formerly CFO Capital) served as the exclusive financial advisor as our client evaluated its strategic alternatives. 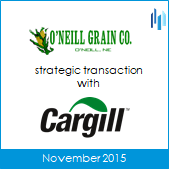 This culminated with a new strategic relationship with Cargill, Inc., that also involved the sale of select assets. Terms of the deal were not disclosed.